1/ Chris Watson – Granite: A sound-work by Chris Watson, recorded on location in the Cairngorms in response to the Granite chapter in Robert Macfarlane’s The Old Ways. 2/ Chris Watson – Stormbeach: A sound-work by Chris Watson, recorded on location on Orford Ness in response to the Stormbeach chapter in Robert Macfarlane’s The Wild Places. The Sea Road will is available as an limited 12″ on Rivertones. 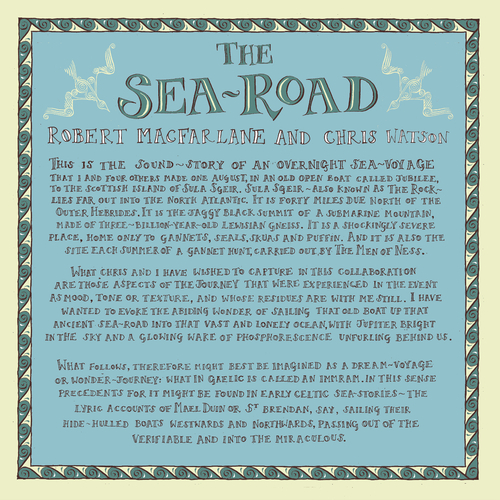 The cover has been beautifully crafted by Nick Hayes (The Rime of the Modern Mariner).